To VeloSolo, where we distribute a range of UK made precision bike components including bolt-on and threaded track cogs, CNC chainrings, spacer kits, handlebars and more. In addition we offer products from companies such as Token, Sugino, MKS, Nitto, KMC, Miche and many others - for fixed wheel or singlespeed bicycles, both on and off-road. We ship worldwide every day with customers in over 60 countries and across the USA. April 18th: large VeloSolo cogs/Boost/spacer delivery just in - please see the blog for details. February 27th: brand new VeloSolo Oversize Disc Cogs now in stock - please see the blog for details. December 6th: stock update - VS chainrings and Disc and Track Cogs back in stock - please see the blog for details. September 26th: Singletrack Magazine reviews our new Boost spacer kits - please see the blog for details. Are you new to fixed and singlespeed bikes? If so our FAQ section is a great place to start and has lots of useful info. As always, please email with any questions, we are always happy to help. Introduction to VeloSolo bolt-on Disc Cogs. Threads damaged on your track hub due to a loose or over-tightened cog? Cranked up that last ridge on your MTB fix and the hub threads gave out? Don't want to carry bulky wrenches and chain whips? Like to try fixed riding off-road without building a new wheel? The bolt-on Disc Cog offers an alternative to traditional threaded track cogs and is suitable for both road and off-road bicycles. Change cogs in a minute with just a Torx or hex key. An end to the possibility of damaged threads, seized or slipping cogs. 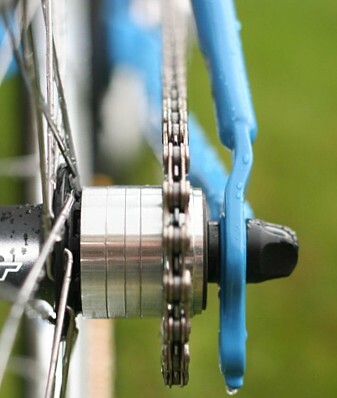 Converts your disc hub singlespeed MTB into a fixed wheel in seconds. An adaptable affordable system that uses any standard six bolt disc hub. Please see shop and faq for full information on bolt-on cogs, hubs and other parts suitable for your fixed or singlespeed road or mountain bike. If you have any questions please send an email. We ship anywhere in the world.